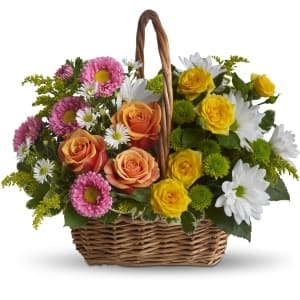 • Brilliant blooms such as orange and yellow roses and spray roses mix with pink matsumoto asters, white daisy spray chrysanthemums, dazzling green button spray chrysanthemums, salal, pittosporum and more in a lovely rectangular basket with a handle. • Basket measures approximately 16" W X 13 1/2" H.
Flowers will be received by a Brockie Donovan Funeral and Cremation Services' staff. The basket was stunning and exactly as pictured - I think it even looked fuller. I was very happy with the quality of the flowers and they were very well received. It was so nice to be able to find an arrangement without lilies and that was brighter to fit the remembrance of a happy fun loving person. All of our flowers are designed and delivered by hand from a local florist in in Brandon.